The Indoor Football League (IFL) is proud to announce the Vidswap.com Players of the Week for Week 3 of the 2019 IFL season. The Cedar Rapids River Kings earned their first victory of the season in Week 3, putting up a season-high 65 points and taking down the San Diego Strike Force 65 -48. Providing decisive and consistent play in the River Kings victory was K Henry Nell. Nell was perfect on the night as he converted his only field goal and all eight of his extra point attempts. Nell totaled 11 points on the night. 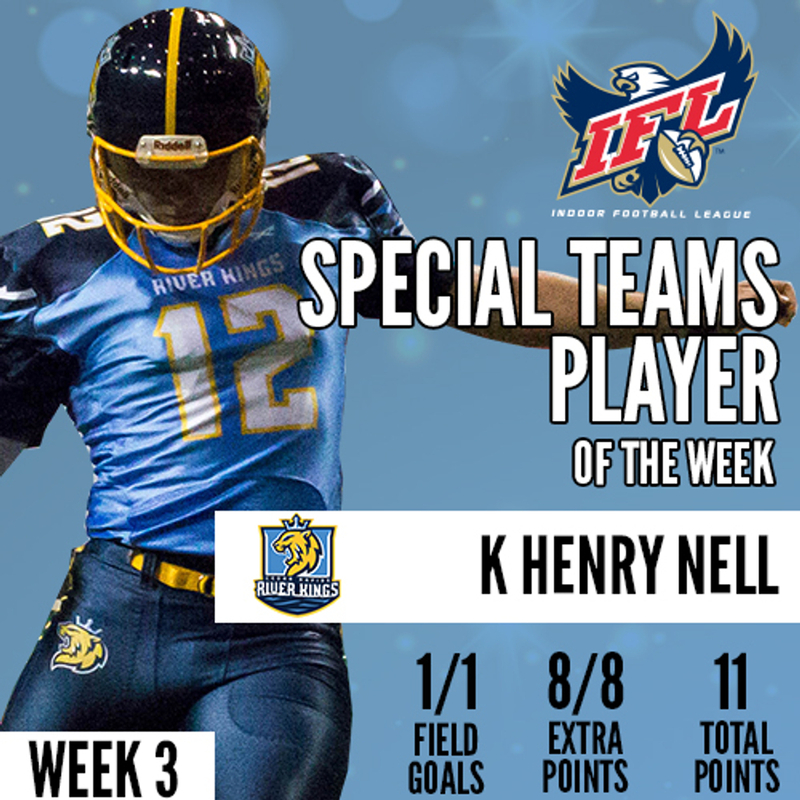 Through three weeks Nell leads all IFL kickers in points (32) and is 17/18 on extra point attempts. Nell and the River Kings host local rival Quad City Steamwheelers in Week 4. The Tucson Sugar Skulls earned their first-ever home victory in explosive fashion in Week 3. The Sugar Skulls took down the Bismarck Bucks 62-42 in a game where veteran QB Matt Behrendt excelled. Behrendt threw for eight touchdown passes in the victory and repeatedly connected on long passes throughout the game. He finished the game completing 19 of 25 passes for 234 yards and eight touchdowns. His touchdown total is an IFL season-high. Behrendt was also a weapon on the ground as he added 72 rushing yards. The Sugar Skulls (2-0) travel to face the Arizona Rattlers (2-0) in Week 4. The IFL’s defending champions Iowa Barnstormers moved to 2-0 on the season in Week 3 after dominating the Green Bay Blizzard 41-3. The three points allowed by Iowa is the lowest in the IFL since 2015 (Cedar Rapids, 0). Key to the Barnstormers victory was DB Jourdan Wickliffe. In the waning seconds of the game the 2018 Second Team All-IFL DB intercepted a Blizzard pass at the goal line and returned it 49 yards for a touchdown. Wickliffe’s interception return for a TD was the first in the IFL this season. Wickliffe also forced two fumbles and led the team with nine tackles. The Iowa Barnstormers have a bye in Week 4 before traveling to face the Nebraska Danger in Week 5.